I truly love Jicama. If you are Mexico or another tropical area where you can get it really, really fresh - all you need is just to peel it, cut a few wedges and squeeze a bit of fresh lime over it. It's the perfect healthy crunchy snack for a warm climate. It's much more difficult to find a fresh Jicama up here. The quality comes and goes. But a week ago I managed to find a fresh shipment at a local farmer's market and snagged a pretty large one. It sat in the fridge for a few days before I decided not just snack on it this time, but to try to make a salad with at least part of it. 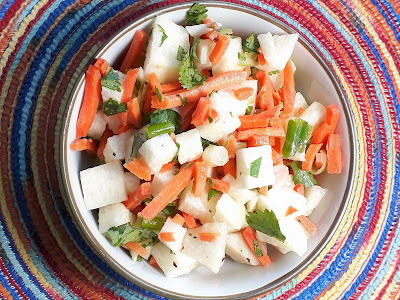 After much searching, I decided the standard ingredients were Jicama, Carrot, Green Onion and fresh lime juice. Outside of that there were a lot of options. Most recipes cut the carrot into matchsticks. Some grated it (okay for the carrots but I thought it would be too mushy for the jicama) and a few diced. I went with a mix. I diced the jicama fairly small to keep that amazing crunch intact. The carrots I broke down and bought a package of matchstick cut ones. I know - not the healthiest choice and I'll do it differently next time. But for this time around I needed it easy. A little green onion, some cilantro, then olive oil, lime juice, salt and pepper. Voila. Best of all it the leftovers have stayed fresh in the refrigerator for several days so I could have it for lunch. I first offer the basics of what I did. Then I share a few options I saw on others sites that would change the flavour a bit and add a bit of spice. One addition I might add next time is pomegranate seeds. Their tart flavour would fit in well and it would add a pop of colour to the visual appeal. Combine all prepared vegetables and cilantro in a medium size bowl. Squeeze limes over bowl and then add a swirl or two of olive oil (I would guess 2 T. Just add a small amount first and increase if you feel it needs it). Sprinkle with salt and pepper to taste, cover and chill in the refrigerator for an 30-60 minutes to allow flavours to combine. Stir once more and serve. Keeps for several days.